The Lady Bird Johnson Nature Loop tours an upland forest where old growth redwoods mix with large fir and hemlock. Lady Bird Johnson dedicated Redwood National Park at this site in November 1968, and the grove was dedicated in August 1969 in recognition of her devotion to environmental causes. The story of Redwood National Park and its constituent State Parks dates back to the 1850s when gold was discovered in northwestern California. Commericial logging quickly followed the rush to support new communities and infrastructure, and redwood was highly sought for its quality and workability. By the early 1900s old growth redwood forests had been significantly reduced and many remaining tracts were held by private interests. In 1917 conservationists Madison Grant, Henry Osborn and John Merrian were inspired by National Park Service head Stephen Mather to evaluate the state of redwood forests. Enthralled by the grandeur but deeply concerned by the extent and pace of logging, they founded the Save the Redwoods League in 1918 to preserve these rapidly vanishing forests. This progressive organization aimed to acquire private tracts and reassign them under state protection. The League and state of California collaborated on fundraising and acquired thousands of acres along Prairie Creek in 1923. Del Norte Coast Redwoods State Park was established in 1925 with a donation of 125 acres, and Jedediah Smith Redwoods State Park was created in 1929. Redwood National Park was established in 1968 by President Lyndon B. Johnson to protect 58,000 acres of jointly managed state and federal property. RNSP was expanded by 48,000 acres in 1977 by President Jimmy Carter to include significant portions of the Redwood Creek watershed. Redwood National Park was designated a World Heritage Site in 1980 and International Biosphere Reserve in 1983 for its unique and irreplaceable biological value. Today Redwood National and State Parks covers 131,000 acres, 39,000 of which are considered true old-growth forest. This figure represents 45% of all protected old growth redwood forests remaining in California. The Lady Bird Johnson Nature Loop leads through an upland forest where growing conditions are less favorable for redwoods. These higher, drier slopes and ridges are more exposed to harsh winds and have poorer soil than sheltered valleys, riparian corridors and alluvial flats at lower elevations. 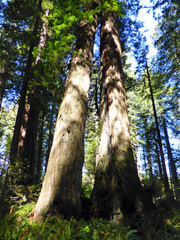 Redwoods at this elevation may only reach 200' compared to 300'+ in their preferred habitat. Here redwoods share space with equally tall fir and hemlock, and a thinner understory dominated by rhododendron, azalea and salal. The Berry Glen Trail splits off the loop and runs 3 miles and 1200' down to the Elk Meadow Day Use Area. Consider this extension for a long day hike or one-way shuttle. Backcountry camping is not permitted on this trail. Dogs are not permitted on hiking and riding trails in Redwood National Park, including trails within Prairie Creek Redwoods State Park. There is no fee to enter Redwood National Park or access the Lady Bird Johnson Nature Trail. The Lady Bird Johnson Grove Trailhead is located 2.6 miles off Highway 101 on Bald Hills Road. Bald Hills Road is located just north of Orick, and .5 miles south of the Elk Prairie Day Use Area. Drive cautiously and watch for wildlife on this steep, winding road.